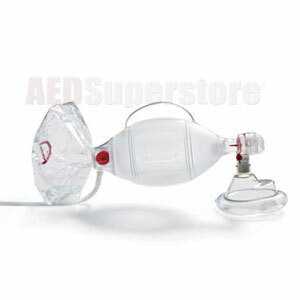 The "Ambu Bag" is the most widely asked for Bag Valve Mask (BVM) resuscitator on the market, and we have them at the right price. Our Ambu SPUR II® resuscitator is for single patient use (meaning it's disposable) and it's not made with natural rubber latex. Made from an SEBS polymer instead of PVC. Buy them individually or by the case. Bag Valve Mask Resuscitators rebreather-type BVMs, and are for use by medical professionals and others properly trained in its use.